With blue and orange cards in their hands, delegates at the 9th World Council of Churches (WCC) Assembly gathered in Porto Alegre next February will wave goodbye to old-style parliamentary majority votes. Does the Council's future lie in consensus decision-making? As the WCC has decided to make its decisions by consensus from now on, 'indicator cards' are one of the methods that will be introduced at the 9th Assembly, where delegates will decide about the direction and focus of the WCC's life and work for the next eight years. What does this mean for the WCC's ability to act? Those in favour of the innovation expect a fundamental renewal of the dialogue within the fellowship of churches and the work culture of the organisation. Critics are afraid that controversial questions will be left out, in order not to endanger the consensus. "On the contrary," says Eden Grace, a WCC Central Committee member from the Religious Society of Friends (Quakers) in the USA. "I hope that more controversial issues will be heard. No one needs to fear to be trapped in a vote any longer." "The consensus model is about a spirit of open listening," says Grace, whose community has 300 years of experience with the consensus model. "We don't just accumulate more messages in favour than against. We work towards a common mind, seeking the mind of Christ." Consensus is more than just a change of procedures. It is also about building a culture in which all have a place. "Debating in the parliamentary style creates an atmosphere of for or against' rather than supporting co-operative listening and thinking," says Anne Glynn-Mackoul, an Orthodox US lawyer and central committee member from the Greek Orthodox Patriarchate of Antioch and all the East, USA. "In the past there has been a pattern of Orthodox minority papers." In those papers, Orthodox delegates articulated alternative views, which were not taken into account, they felt. Eden Grace and Anne Glynn-Mackoul were members of the Special Commission on Orthodox Participation in the WCC. Established by the 8th WCC Assembly in Harare (1998), it addressed Orthodox concerns with the direction and priorities of the Council and in 2002 made a number of proposals to enable the Orthodox voice to be more effectively heard. One of its recommendations was to abandon the principle of majority decisions in favour of a consensus model. In February 2005, the WCC Central Committee adopted this suggestion unanimously. 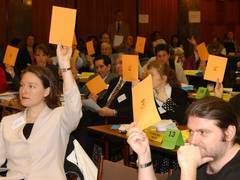 Does the consensus model give the power of veto to every single delegate of the WCC Assembly? "No," says Eden Grace, "everybody has the right to be listened to, but there is no right to obstructionism." A majority of 85 percent of delegates will still be able to call for a formal vote as a last resort. Only votes on matters that put the self-understanding of a member church into question are not possible. Consensus is not confined to unanimity. A minority view can be overruled as long as their point of view has been heard full and fair. It will then have the possibility to stand aside from any action or programme following from this decision. This is a way to adapt the rules to reality. 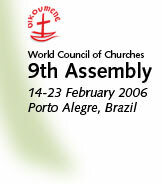 Even today, there are WCC programmes where some churches are not involved. "We will all need a lot of training," says Rev. Dr D'Arcy Wood, former president of the Uniting Church in Australia, where the consensus model was introduced ten years ago. "This is not a light switch that just needs to be turned on," he says. "This requires a change of one's expectations and approach to decision-making." A manual for consensus procedures will help Assembly delegates to get accustomed to the new conduct and methods. Furthermore, there will be training sessions to prepare committee moderators and rapporteurs before the Assembly. Pre-assembly meetings like the youth event will offer opportunities to get to know the methods. And delegates will receive the necessary training right at the beginning of the Assembly. The new consensus decision-making process will first of all be a challenge to the moderators, both in terms of a careful preparation of each meeting, 'streamlining' the agenda, and in making sure that differing voices are heard. And what will happen if an Assembly committee or a decision plenary comes to a deadlock? The new rules offer a number of possible ways to proceed in such situations: the disputed issue can be adjourned or referred to a smaller working group. The meeting can pause for breath by observing a moment of silence or prayer. The different points of view could be recorded. Or delegates could record that a consensus of opinion was not possible at that point. The most apparent innovation for delegates at the Assembly will be so called 'indicator cards'. The consensus manual states: when delegates follow a hearing with "warmth towards an idea or acceptance of it", they can signal this to the moderator with an orange card. A blue card shows "coolness or disapproval". Both cards crossed in front of the chest while a speaker is still at the microphone, silently indicate to the moderator that prolonging debate is not seen as helpful by delegates. A first evaluation of consensus decision-making at WCC will not be possible until after the Assembly. But the Australian experience makes D'Arcy Wood confident that consensus will be a success: "Our model is more free-flowing and flexible. More people are included in the 'wording' of decisions. This leads to much higher levels of satisfaction, and more ownership of decisions. More people have become actively involved in the implementation." This is exactly what WCC wants to achieve in the decision-making process at the Assembly in Porto Alegre and beyond. The diversity of contributions will not, it is hoped, separate churches, but enrich the fellowship and the life of every church. (*) Friedrich Degenhardt is a journalist and a theologian from the North Elbian Lutheran Church (Germany) currently seconded to the media relations office of the World Council of Churches in Geneva.